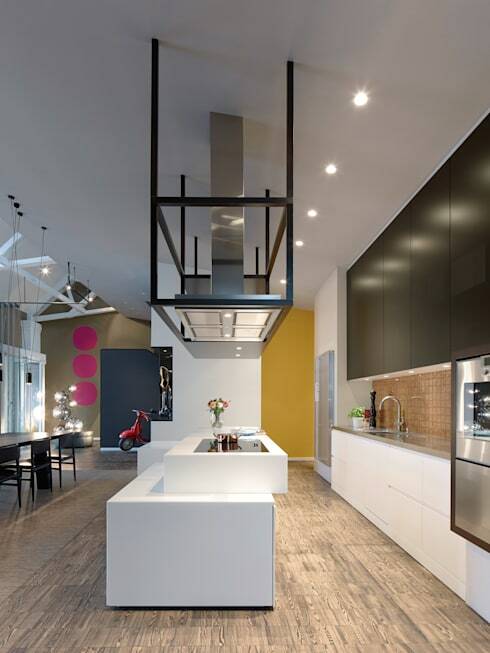 Inviting colours and a beautiful blend of textures and tones make this loft in Esslingen, Germany a standout. Approximately 4,300 square feet, it's a luxurious pad full of modern surprises. Hats off to the designers at Ippolito Fleitz Group - Identity Architects for hitting the mark on this one. Zooey Brown gets credit for the beautiful images. 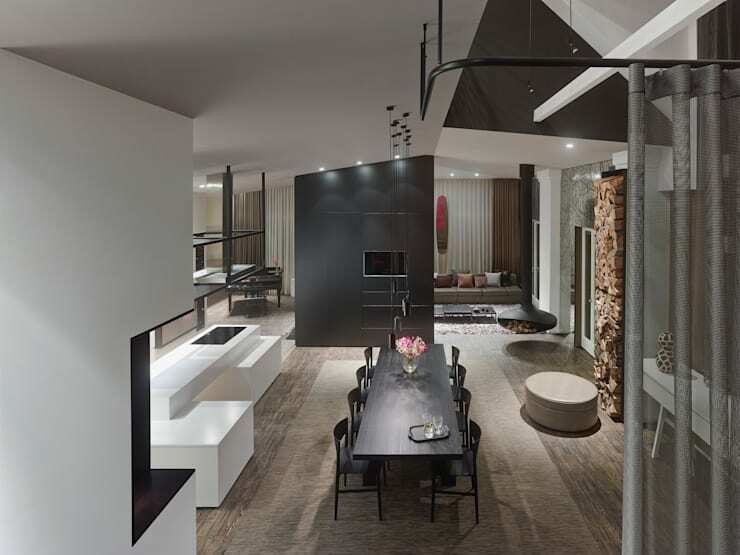 Upon entering this amazing loft you are struck with its luxurious modern vibe. The way the space opens up is perfect, there is an inherent flow to that leaves you eager to see what's just around the corner. The dining area has an elegant yet cozy feel to it. The table seats eight people, perfect for entertaining. The highlight however is the unique way they've stored wood for their drop-down fireplace. It's an eye-catching feature that not only divides the space but blends perfectly with the modern-rustic elements throughout the space. The layout of this kitchen is made for a chef, the design and accessibility function hand in hand making this a great place to cook up tasty meals for loved ones. 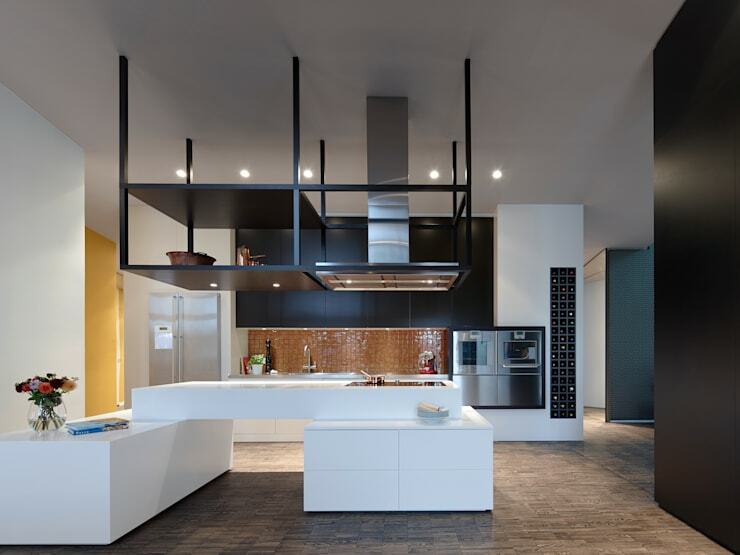 Contrasting colours bring a sense of balance to the kitchen. The darker hanging shelves above are perfect space savers and a nice spot for pots and pans to be stored. The dining room and kitchen communicate with each other nicely to create a wonderful ambience and an ideal environment for entertaining. It's easy to carry on a conversation while preparing a meal for your guests in this space. The best part of loft living is being able to embrace all the wide open spaces, it's such a refreshing feeling that nothing feels closed in or stuffy at all. 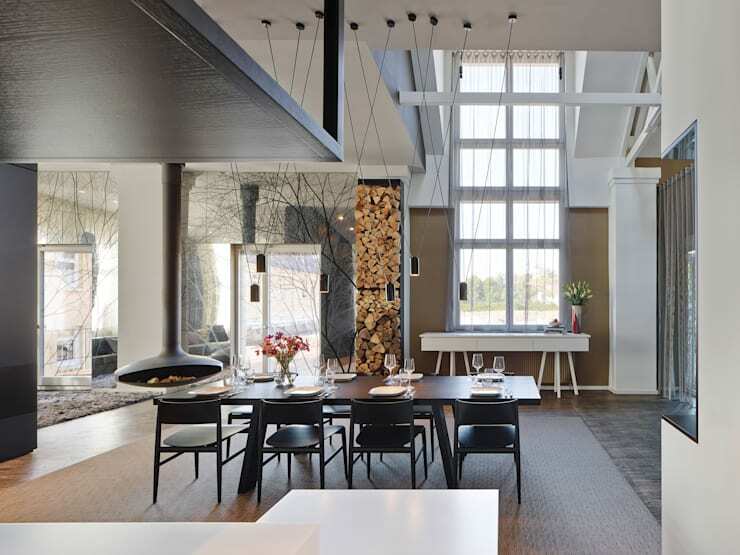 Yet despite the openness of the loft there is still a simple interconnectedness between the different rooms of the home. Each room has it's own identity yet it functions cohesively as part of the same space. From the seating area we have wonderful views of the rest of the loft and access to the outdoors from the sliding door on the back wall. The area gets a good amount of natural light pouring in to brighten up the space. 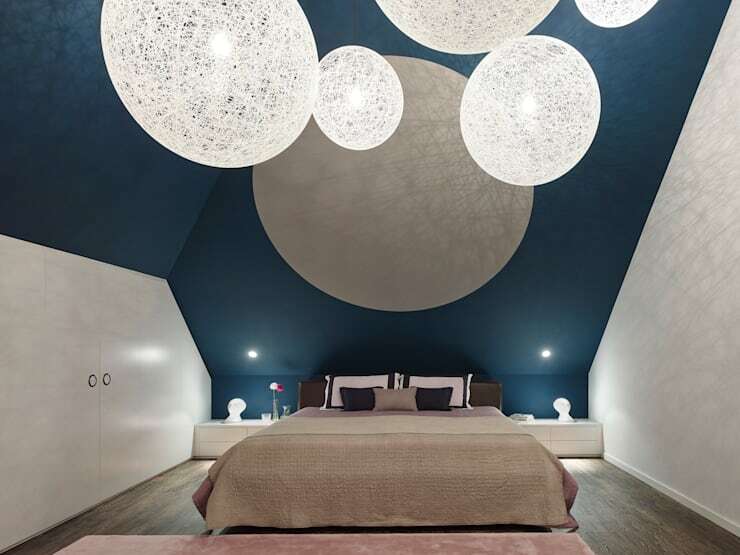 Wamer materials and tones were chosen for the decor to contrast the lighter neutral colours found throughout the loft. 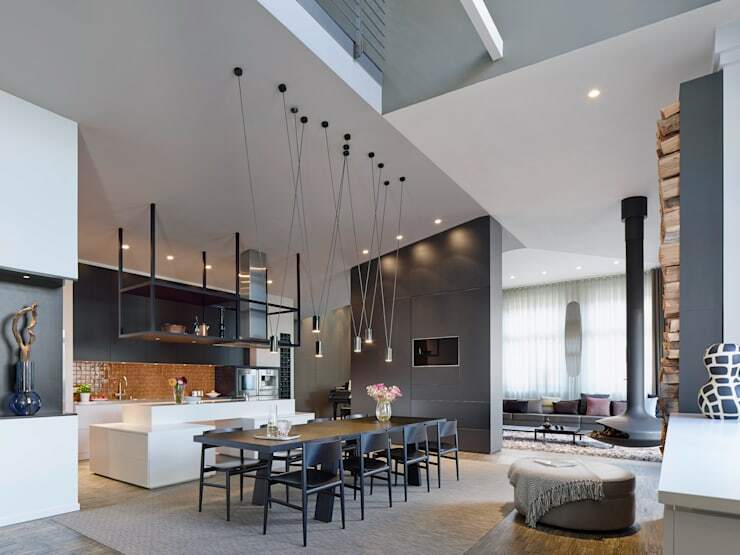 The tall ceilings add to the majestic feel of the loft, you really get a sense of how big the space is when you look up to the towering ceilings above. It has a modern industrial feel to it with all the comforts of a conventional home. If you don't want this tour to end don't worry we have another beautiful loft you can peek into. 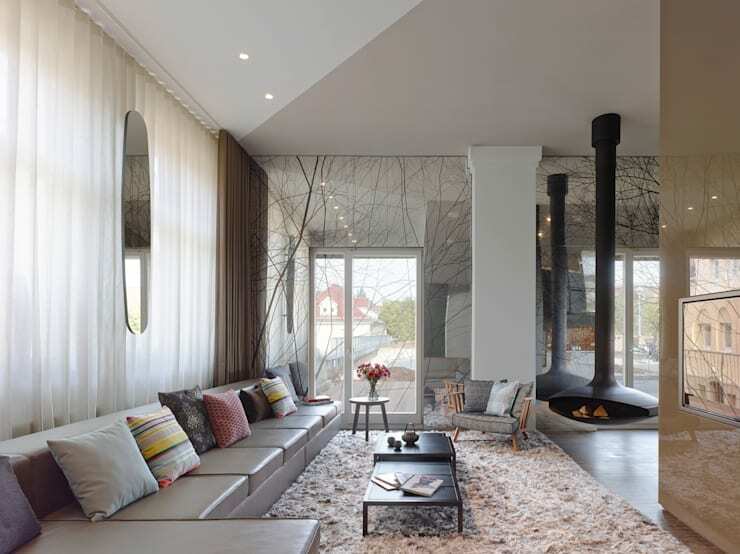 The fireplace is a definate eye catcher indeed. It brings a creative spark to the area and acts as a marker to divide the space from the dining room and seating area. If you like this fireplace and want to see more unique fireplaces you could have in your home be sure to browse homify's huge selection. 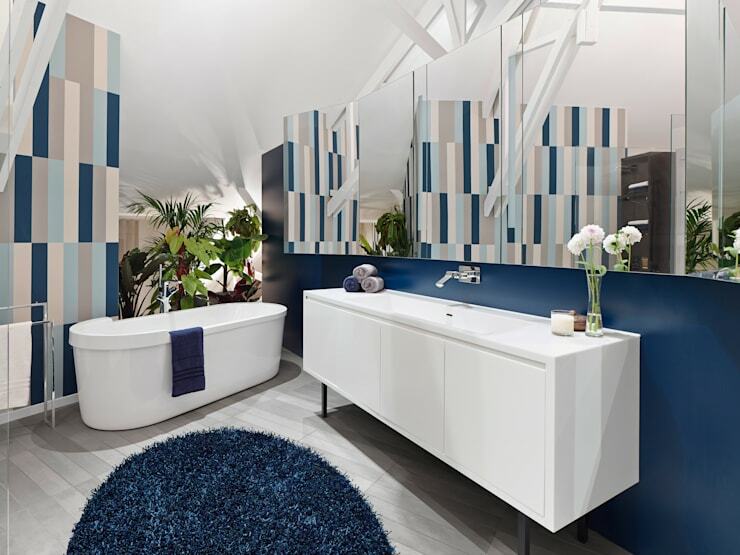 The powder room is very bright and spacious, we love the blend of blues and white tones used for this room. The retro tile gives the room a mid centry modern feel. And the free standing soaker tub looks like a nice spot to relax. Look at this little nook! Don't you just love the abstract look of this vanity? 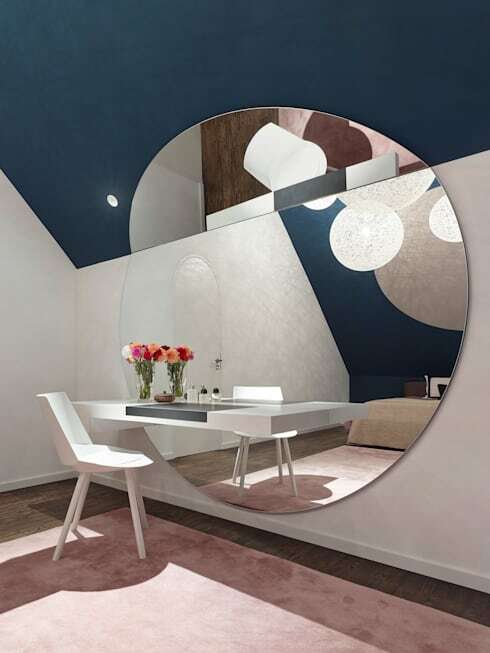 We love the way the mirror extends to the roof and how the table is built into the design. This looks like a great place to get ready in the morning. We get a real playful sense when entering this room, the light fixtures are bold but refined adding to the whimsical presence the room has already. The darker indigo colour on the wall gives the space a certain depth contrasting the lighter textures we see throughout.